Dream about the tranquillity, beauty and luxury between the ocean and mountain range. 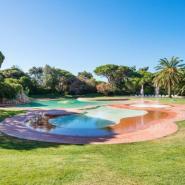 The emblematic Quinta da Marinha receives the luxury Martinhal Lisbon Cascais Family Hotel, involving you with the perfume of the sea and gardens, and with the silence of the wind's whispering in the pine trees. Designed by the architects João Paciência and Francisco Caldeira Cabral, this hotel raises itself in communion with the ocean and the mountain range. The different textures of stone and wood are essential parts of the decoration, where the golden tones of earth or the ochre of the hillside predominate, along with whites and creams, creating a natural fluidity that accentuates the spirit of the place. The hotel provides deluxe rooms and suites, with balconies or terraces with views to the gardens and golf course, spacious and equipped with bunk beds for the children. There are also private villas with two rooms and a living room, ideal for larger families. It has several dining options, from the more informal to the most refined, to experience gourmet flavours, fish and shellfish, Italian or international cuisine. There is also a thalassotherapy center and SPA, to benefit from rituals and therapeutic treatments of beauty and relaxation with sea water, with state-of-the-art equipment and high quality cosmetic products. The daily fun for children is assured by the activities at the Kids Clubhouse, supervised by the responsible and caring staff, or by the various playgrounds dotted on the hotel property. Bring your family, enjoy the tranquility of Martinhal and the friendly town of Cascais. Leaving the Lisbon airport, take the “segunda circular” motorway in the direction of the city centre for about 6,7 km. Take the A5 exit in the direction of Cascais and go on until the end for about 21 km. Exit at the A5 end in Cascais - Birre and turn right on the first roundabout to Birre. On the second roundabout turn left to Torres and after 900 meters turn right on Rua das Codornizes. After about 200 meters turn left on Rua da Galinhola and then right on the Rua dos Tordos. Follow for about 500 meters and turn right, pass the Hotel Quinta da Marinha and turn on the second on the left on Rua do Clube. From then on, follow the signs to the Hotel.